Yes. Just stay above 7th. Remember that USF team that didn't have much energy two nights ago? With 14-1/2 minutes to go in the game, they are even with GU 50-50. WTH? Update: GU wins by 11, 81-70 in a game that was closer than the score. And most importantly, this time last week the Pilots were in a knot of three-win teams that were looking up at five-win San Diego and Santa Clara for fifth/sixth. Now Santa Clara still has five wins with a four-game losing streak, plays the next three on the road, and has Pacific/Saint Mary's at home to end the season. Absolute best-case finish for SCU is 8-10. San Diego at home to Pacific on Thursday, but then the schedule maker slaps them with Saint Mary's, BYU, and Gonzaga in back-to-back-to-back games. Best-case scenario for USD is probably 8-9 heading into the final game of the schedule at Chiles. Pilots? Now they've got four of last six at home, and one of the two away games is what should be the most winnable road game in the WCC this year (Pacific). They're going to be favored to win four of these six...3-3 will at the very least get them away from Friday in Vegas, and 4-2 would basically lock up the #5 seed to set the Vegas road as BYU or PEP in the quarters and Gonzaga in the semis. Last time this board laid out a "next six games" scenario it didn't go so hot...let's hope for a different outcome this time around. I guess mathematical chances still exist for both Pepperdine and Portland for NIT consideration...but both teams are seven wins away from even the NIT bubble with five and six games left on the WCC schedule, respectively. Terry Cahill wrote: Last time this board laid out a "next six games" scenario it didn't go so hot...let's hope for a different outcome this time around. The key is to start with a strong game on Thursday. Previous Pepperdine game was very close the entire way, but Kevin was a one man show. The team is playing much better now with more contributors. I guess that's what Rev is thinking, too. @CoachReveno wrote: Sure nice to get road sweep but really proud of how the team prepared last week to put us in position to win. Healthy and focused does work. A win on Thursday would be huge. Pepp is a little hard to figure out this year, with some great wins and head-scratching losses. If we come out and play with the discipline and energy of the past couple games, I like our chances. 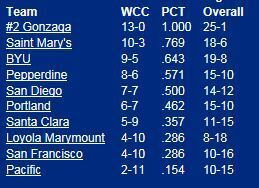 Getting back to .500 in WCC play would be awfully nice! Hard to figure out? I'll say! Since they last played us, 5 of the 6 games they've played turned out with an upset, IMO. They lost a road sweep to the teams we just beat, USF and SCU. Then, after taking care of UOP, they beat SMC in Moraga and BYU at home. Then they get blown out at home by USD? I have no idea what Pepperdine team we'll see on Thursday. up7587 wrote: I have no idea what Pepperdine team we'll see on Thursday. I'm more concerned about what UP team we'll see! Consistency has been lacking for the Pilots this year. The last two games have revived a glimmer of hope for the season (and, frankly, for the direction of the program). It is time to bear down now and bring the same intense energy and focus EVERY night. It would really help to have a good home crowd -- and a loud, involved student section -- for this weekend's games! NoPoNeighbor wrote: I'm more concerned about what UP team we'll see! Consistency has been lacking for the Pilots this year. Regardless of the outcome, the Pilots are a much better team than just 10 days ago because, for the most part, everyone is healthy and back in game shape. Pilots fans cannot underestimate the loss of Riley for the season. It doesn't take a rocket scientist to realize the Pilots started struggling went he broke his knee. He is the guy who played stellar defense by disrupting opposing offenses and he rotated in an out of the lineup with the other bigs so fatigue was less of a factor. When KB went down for eight games he could not perform any workouts or exercises that would put strain on his foot, consequently, it has taken him a few weeks just to get into game shape and contribute to the TEAM instead of working so hard on his individual performance that he was hurting the team. Finally, when Bryce suffered the concussion against GU it had a huge impact on team chemistry...especially on offense. Remember, Alec has been suffering from a hip pointer and takes a constant beating, and even if he were 100% he can't go 40 minutes or play much in excess of 30 minutes in back-to-back weekend games.....the Pilots needed Bryce to run the point in Alec's absence. Xubi did an admirable job on defense, but it was obvious he had little offense to offer. Injuries and illnesses are going to affect all teams (Jake was suffering from some sort of virus this past week), so it's going to be up to the bench to pick up the slack and play their best if the Pilots are going to continue winning. We are currently 1 game up on our performance from last year (last year we had 4-8 record in the games that we have played so far this season; this year we are at 5-7). Last season, we won both of the upcoming games (home against Pepp and LMU). We need to win both games this week to stay ahead of last season's team (and thereby demonstrate that the program is making progress!). Man, no matter what numbers we look at, that LMU game sticks out. Odds will favor a win at UOP, I'd love to see a repeat of the BYU win, which is not out of the question, and the USD game will be a big one. But a win Thursday is big. There are six games left. They are al big, at least in that we need to at least break even. WCC game of the night should be SMC at BYU (ESPN2). BYU is not out of reach in the standings, SMC is, so root for SMC. UOP goes to USD, so it will be hard to make up a game on the Toreros. SCU goes to USF (ESPNU). USF is 2 behind the Pilots in the win column, while SCU is tied with us, but a tiebreak behind. I think we root for the Dons here. And a valiant LMU effort in Spokane that leaves them tired for Saturday's game would be nice. up7587 wrote: SCU goes to USF (ESPNU). USF is 2 behind the Pilots in the win column, while SCU is tied with us, but a tiebreak behind. I think we root for the Dons here. I see this one as a win-win. Either USF loses (which is always fun), or Santa Clara loses which is more relevant to the Pilots right now as far as middle-of-the-pack standings. I'd like to see Saint Mary's beat BYU on the road...that might at least get them back to near the NCAA bubble. On an aside...I haven't seen this mentioned on here, but anyone remember the win over Murray State? Well, the Racers lost to Valpo the next day in Nashville...and haven't lost since. Murray State is now 21-4 and riding a 19-game winning streak, and can make it 20 tonight with a home win over SIU Edwardsville. Remaining Pilot games: LMU, @SMC, @Pac, BYU, USD. With USF's win over SCU, we essentially have a 2-game lead over the Broncos thanks to our tiebreaker. SCU finishes with 4 games on the road, @LMU, @Pepp, @SMC, @Pac. Advantage Pilots. LMU: @Port, USF, SCU, @Pepp. If we are able to take care of business Saturday, I don't see them catching us. USF: @LMU, @Pepp, SMC, Pac. I don't see USF winning more than 2 of these games, and could lose all of them. Who knows. USD plays SMC Saturday, then @BYU, @GU, @Port. Advantage Pilots, especially with our chance to clinch the tiebreaker. Pepp: @GU Saturday, then home vs. SCU, USF, LMU. Being that they have a 2 win lead (hopefully only 1 after Saturday), and a less challenging series of games for them at home, it will be tough to overtake them. Advantage Waves. The 6th place team plays the 3rd place team, while 5th plays 4th. As it stands now the 4th place team is Pepperdine, the 3rd place team is BYU. Upon further reflection, I'd rather be 5th. I'd rather play Pepperdine with a chance at GU, vs. play BYU with a chance at SMC. I think USD has won their last game, they play the top 3 teams: an angry SMC, and the two toughest road games in the conference at BYU and GU. And of course the red hot Pilots! Pepperdine looked like they had nothing tonight, but USF and SCU looked pretty bad too, and I don't think it was all good defense. I think PU will win a couple more games for 10 total. I think the Pilots will end up with 9 wins, beating LMU, UOP and USD. A win over BYU could earn a 10th place, but I think Pepperdine has the tie-breaker; isn't it victories against higher seeded teams? They have 3 of those already. So 4th place might require a win in Moraga and sweeping out. 5th looks most likely. Of course, I should put on my Eeyore face and say we could lose them all, too. LMU could catch us and they'd have the tie-breaker. Im just worried about the weekend. Geezaldinho wrote: Im just worried about the weekend. That is critical for players and coaches. For yahoos with a keyboard, not so much. Maybe that's it. I don't use a keyboard. Apparently the game of the day is slated to be in San Diego....a win by SMC would probably help the Pilots' cause the most. I was watching part of the USD - st. Mary's game. USD up by 4 in the closing minutes! Come on Gaels! Overtime at the Slim Gym! SMC survives in double-OT. Phew.